The baritone, Sabcho Sabev, was born 5 April 1899 in Venice, Italy. His mother was Italian. As a child he studied piano, violin and trombone in addition to having an interest in opera and the dramatic theater. Between 1928 and 1932 he studied at the Santa Cecilia in Rome as a student of Rozatti. His singing made such an impression on the teachers that he was invited to participate in many operas and concerts. Together with Italian singers and conductors he toured many of the Italian opera houses including Milan and Venice. He was considered representative of the Italian bel canto style. 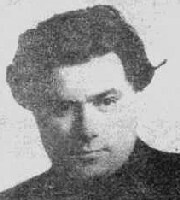 His debut was singing Marcello in Boheme with the Sofia Opera on 3 March 1924. Between 1928 and 1932 he performed in Milan, Venice, Torino, Palermo, Germany, Malta, the Netherlands, France and South Africa. During these tours he achieved his highest degree of international fame. Through his engagement with the Sofia Opera in 1924-28 and 1932-48 he sang most of the baritone repertoire, in all a total of over 500 performances. He toured Germany again between 1939 and 1941. In 1948 Sabev became the Artistic Director of the Varna Opera in addition to becoming one of the most important vocal teachers in Bulgaria. Some of his students included Nikola Nikolov, Georgi Belev and Dimiter Kozhouharov. On 29 May 1950 Sabcho Sabev died on the stage of the Varna Opera singing the role of Eugene Onegin.